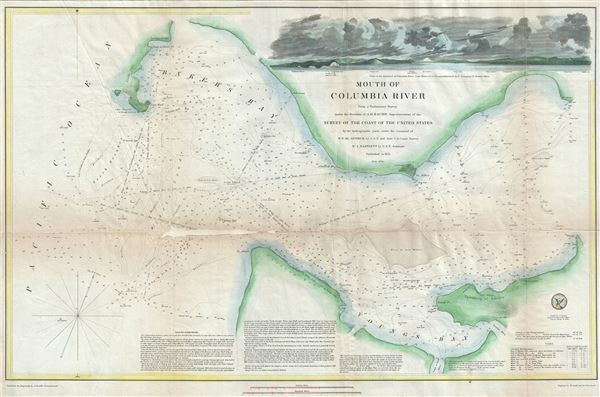 This is an attractive example of the U. S. Coast Survey's 1851 nautical chart or maritime map of the mouth of the Columbia River. The Columbia River, the largest river in the Pacific Northwest region of the United States forms the border between the states of Washington and Oregon. This map covers from Cape Disappointment or Hancock to Pt. Gray or Grays Point in the state of Washington and from Point Adams to Tongue Point in Oregon, and includes the township of Astoria. The map offers exceptional detail throughout and includes countless depth soundings. Along the lower border, sailing instructions, notes on tides and a wealth of other practical information for the mariner are included. The upper right quadrant includes a beautifully illustrated view of the entrance of Columbia River – Cape Hancock or Disappointment. The hydrography for this chart was completed by a party under the command of W. P. McArthur and W. A. Bartlett. The entire chart was produced under the supervision of A. D. Bache, of the most prolific and influential Superintendents of the U.S. Coast Survey. Report of the Superintendent of the United States Coast Survey, Washington, 1851. Good. Some loss with verso reinforcement near center, close to Pt. Adams. Some wear and toning along original fold lines. Fold creases at places. Backed with archival tissue for stability.